That 2-hour number is completely arbitrary, but it sounds so good. So good, in fact, that Strava hosted a competition (event? challenge? it's own publicity stunt?) to get people to do a half marathon in under 2-hours. 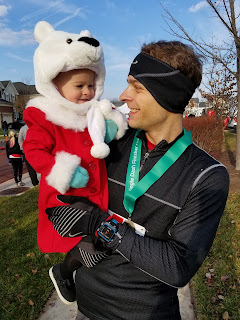 When this event kicked off, I was in the middle of my marathon training plan and I had a 16-mile run planned, which was at a pace that put me sub-2 for the first 13.1 miles of the run. What I soon discovered was that the entire activity, regardless of how much longer it was than 13.1 miles, had to be sub-2 hours. So my 2:02:49 16-mile run did not trigger the Strava badge for me. Obviously the marathon I ran at the end of that training cycle, which was also sub-2 hour half marathon pace, did not trigger the badge either. After the marathon I was in no shape to do any long runs, so I focused on my recovery, not giving any more thought to the Strava challenge. Then I donated blood. Then it got really humid. Then I realized, I could just get up a little earlier one morning and run a half marathon in under two hours. So I did. I got a notification from Google Photos to look at this day five years ago, and there were pictures of me just having completed the Wine Country half marathon. At that point, I had not run a half marathon in the last 6 years and my goal was to break 2-hours. I failed that goal, coming in at 2:05:46. At the time I was upset (literally - my stomach was upset. 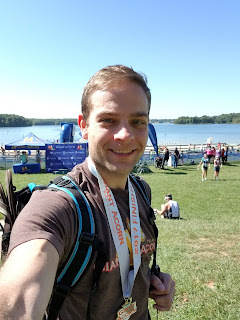 It was not a pleasant post-race party), but now I marvel at how I was able to go from not being able to break 2-hours in an "A" race, to waking up early one morning and running a half marathon on a whim, at an easy pace, in the humidity, and knock out what I couldn't do just a handful of years earlier.